If you are a parent of a teenager, you likely receive regular updates on all manner of technological advances. These updates are dispensed with nagging regularity, usually in the form of, "Hey, did you see the new Verizon phones? They clean your room and do your homework! Mine doesn't do that!" Although we upgraded my teen daughter to an Optimus S Android smart phone last December, the onslaught on techy updates resumed fairly quickly, sometime in February! While my husband and I have been able to withstand her persistence thus far, with so many fantastic deals on the latest technology this holiday season, we couldn't help but to take a peek at the newest cell phones while we shopped. Also, although I was originally taken in by my cute, green, little eco-friendly, decidedly not smart phone, I am personally tempted to make the move to a smart phone! We first stopped at our local Verizon store to see what they had to offer, especially as my daughter keeps insisting that Verizon has the best coverage. As you might imagine, they were quite busy, with many holiday shoppers of the same mind! Not only did we love the friendly, open layout of the Verizon store, we were also quite enticed by a holiday display of Motorola Droid Bionic and Razor 4G phones! Fortunately, there were plenty of knowledgeable staff members on hand, to assist the throngs of shoppers. Although I usually spend time online researching tech items before making my purchases, the Verizon rep that worked with my husband and I was wonderful. Very patient and helpful with our multitude of questions, he was able to easy answer each one, helping us to compare features, prices and service. My husband and I appreciated the layout of this Verizon store, with small, individual displays of various tech gadgets, usually grouped in threes. With placards for each item, highlighting the features and costs, as well as promotions and savings, it was easy to browse on our own, as well as served to assist us in asking our rep questions. 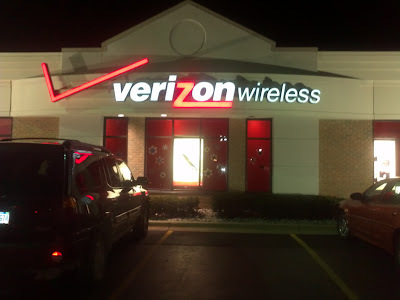 With this Verizon store located literally a few hundred feet from a Best Buy, I inquired if there were any advantages for shoppers in shopping directly with Verizon, as opposed to at a big box retailer. The answer I received was quite enlightening. The Verizon rep shared that although big box stores carry various tech gadgets for a number of manufacturers and service providers, Verizon Stores will have the fullest selection of Verizon compatible products. As well, their knowledge and training is more in depth, as they focus solely on Verizon products. Additionally, an important point to note is the level of service. While some big box stores offer services, such as set up and trouble shooting, shoppers often have to pay additional fees to access. When you purchase directly through the Verizon store, the staff will walk you through all aspects of set up, helping you with any features you don't understand, as well as assist with any trouble shooting, all free of charge. The ratio of shoppers to reps at the Verizon Store is very appealing as well, lending naturally to more personalized service and time available per shopper. From a pricing standpoint, shoppers will find there are often some variances between special promotional prices at the Verizon Store, big box stores and via shopping online. Both the Motorola Droid Bionic and Droid Razor are very attractive choices for upgrading my family cells. The Bionic and new Droid Razor have Android operating systems, but with 4G speed, both models leave our current models in the dust. In considering memory, my daughter's current phone comes standard with 512RAM and 512 ROM and a 2 GB Memory Card but can be expanded to 32 GB. 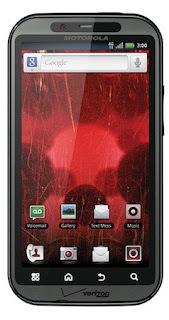 Both the Motorola models have 16GB internal memory, as well as 16GB installed micro SD cards and 1G LP DDR2 RAM. In some cases, bigger does mean better, with the Bionic and Razor having Dual Core 1 GHz processors. Sharing capacity is another strong point for the Motorola models, both boasting 8.0 MP cameras and front facing web cams for video chatting, a big improvement over the 3.2 MP camera in my daughter's cell. The Motorola Bionic, Razor and iPhone 4S all offer1080 HD video capture. As most teenagers, my daughter spends more time texting than talking, thus the keyboard functionality on any cell phone of significant interest. While her cell does have a touch screen and virtual QWERTY keyboard, both the Bionic and Droid Razors do as well, but offer the largest screens, both measuring at 4.3", the biggest of the various phones I looked at. Even more big improvements are offered in the newer models by way of talk time and standby time. Currently, my daughter is maxed out at 5 hours of talk time per charge of the Lithium-Polymer battery, the Lithium-ion batteries of the Bonic, Razor extend talk time significantly. Both models have comparable standby times, ranging from 199 for the Bionic to 204 hours for the Razor. A bigger spread is evident in looking at talk times, the Bionic offering 10.8 hours and the Razor, 12.5 hours. In cell phones, size matters, the smaller and lighter the unit, the higher is its cool quotient. In this aspect, the varies models are again varied. The Droid Bionic weighs in at 5.6oz, with dimensions of 5.0"x 2.6" x 0.4" The Droid Razor's weight is 4.48oz and dimensions of 5.15" x 2.71" x 0.28". As with much of our holiday shopping, price is a big factor. Via the Verizon online store, with a two year service agreement, the Motorola Droid Bionic is available for $199.99 or the Motorola Droid Razor for $299.99. Although considering that the Motorola Razor is constructed with Gorilla Glass and Kevlar, making it essentially indestructible, I am appreciating the savings of the Bionic. On the topic of savings, upon perusing the various service plans, I was very surprised to learn that Verizon now offers Pay As You Go, No Contract Plans as well as Family Share plans. The options for saving are quite attractive. The flexibility also extends to Data Plans, with ability to select packages with just the amount of data you need contract free, for Xoom and the new Galaxy tablets! While the speed and features of any of the 4G phones we looked at would be a vast improvement for both myself and my daughter, my husband was sold on the great price of the Motorola Droid Bionic and we both appreciated all the options for Family Plans from Verizon. We were impressed with the knowledgeable and personal service we received from the Verizon reps, as well as the aesthetic appeal and layout of the store. This Mom is hoping my husband caught on to my not so subtle hints at the tablet counter! Are you shopping for a new, techy gadget this holiday season, a new phone perhaps? What are you replacing, for whom it is for and what new techy delights have caught your eye? Tell me in a comment below, I'd love to hear about it! nice looking phone! I have a very old iphone and I need a serious upgrade! Wow that`s a skinny phone! We don`t have Verizon stores here but I`ve been to the Bell Store and Fido Store and they are definitely more knowledgeable for their own phones. I have been debating on getting a smart phone in the near future. My phone is also not a smart phone. These phones look awesome! >.< Now I want one!